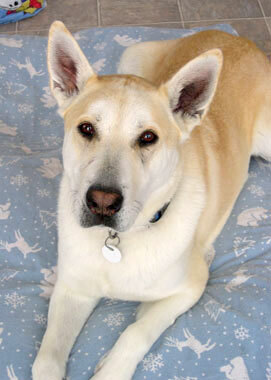 Cedar came to us from a shelter in Wenatchee, Washington. 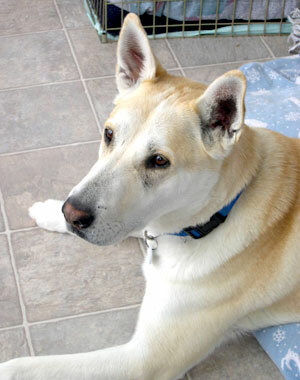 The shelter was full and Cedar was in danger of being euthanized to make room for new, more “adoptable” arrivals. A volunteer asked if we could save this handsome blind boy. An all-volunteer transport group brought Cedar out to Montana. We realized right away that he is as sweet as he was described. He had been dumped at the shelter by his family for reasons we don’t know. 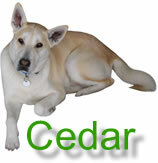 At some point in his life Cedar had been hit by a car, leaving scars on his legs and a slight limp. He is a blind from a disease called progressive retinal atrophy. 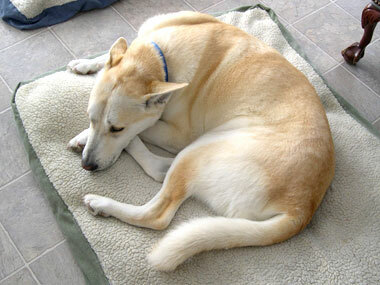 But he is otherwise healthy and – like all of the blind dogs here – he gets around just great. Today Cedar is enjoying his life at the sanctuary with his other disabled friends. And every morning, on the way out to the dog paddock with his buddies, he likes to stop and give us a kiss. He is a Lab/Husky mix who can howl like a wolf. One of his favorite things to do is get the entire Rolling Dog Ranch dog pack singing in a chorus of howls. (It would help if they could read music, because someone is always off-key.) Cedar is usually standing just off to the side, head up in the air, howling – apparently he thinks he’s the band leader.